Review K2’s response to Gartner’s report now for an interpretation of how an organization can seek relief from overwhelmed development resources. It is indeed an important time for businesses of all shapes and sizes to stop and take an inventory of current business operations to determine how best to break down the silos between lines of business and IT infrastructure. From low-code applications to the concept of ‘citizen developers’, Gartner has released three key predictions in their report “Gartner Predicts 2016: Business Transformation and Process Management Bridge the Strategy-to-Execution Gap” that encourage business transformation leaders to explore ways they can create the ultimate customer experience. Key report finding: The demand for applications that enable the business to be more productive and effective greatly outstrips the available development resources within the enterprise IT department. *Gartner Predicts 2016: Business Transformation and Process Management Bridge the Strategy-to-Execution Gap, 30 November 2015, Elise Olding, Michele Cantara, Bruce Robertson, Rob Dunie, Olive Huang, Samantha Searle. 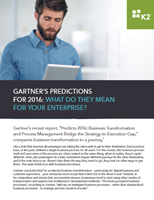 Interested in reviewing the full Gartner report? Request it now!